How Long Will My Hot Tub Last? | Cleveland OH - Leisure Time Warehouse | Hot Tubs, Swim Spas, and Pools. Ohio's Best Dealer! If you are thinking of purchasing a hot tub, you probably have a lot of questions running through your mind. 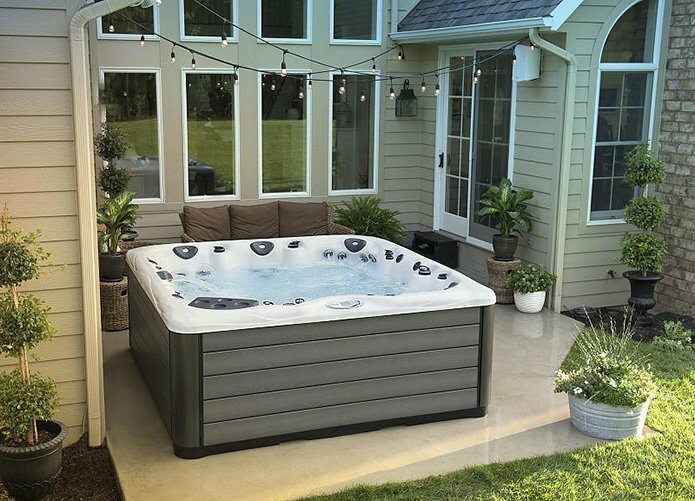 One question that is probably at the top of your list is how long your hot tub will last, an important thing to consider. Typically, hot tubs constructed with inexpensive and lower quality materials will last about five years. While, hot tubs constructed of high-quality materials will last much longer up to 10 years. This is important to know when you begin shopping around to make sure you deal with a retailer that carries premium, high quality brands. Higher quality hot tubs, generally, include a longer warranty but also a higher price tag. The old saying is true that “you get what you pay for.” This old saying relates to the quality of a product. To avoid high prices, if you purchase a low-quality product, do not expect a high quality product value. How long a hot tub lasts depends upon the care and maintenance of the product. To lengthen the lifespan of your hot tub, purchase a good quality hot tub cover. Use good maintenance steps with quality products. Hot tub chemicals can wear down the plastic parts of a hot tub. Regularly clean the hot tub parts, filters, hoses, and other hot tub tools and toys. Keep the hot tub surface and the water clean. To avoid injury, keep the path to the hot tub clear of debris. This is an important safety measure. Some maintenance steps will need to be performed on a weekly basis. While other maintenance tasks will need to be completed using a monthly as well as a yearly schedule. On an annual basis, some hot tub owners completely drain and scrub the hot tub. Check your hot tub manufacturer’s manual. Follow the steps found in the manufacturer’s guidelines. Ask your salesperson for a manufacturer’s maintenance guide that contains helpful tips. There are a variety of hot tub styles available for purchase. Before purchasing your new hot tub, conduct a lot of research. It will help you to decide which hot tub style is best suited for you and your family. Purchasing a hot tub is a big investment and you want to make sure that you receive the best value and return on investment. Whatever style of hot tub chosen, regular maintenance is of paramount importance. How long should a hot tub heater last? With optimum water balance and monthly water testing, the lifespan of a hot tub heater is approximately five years or longer. How long should a hot tub pump last? With regular use, a quality hot tub or spa pump can last up to ten years. If your hot tub pump is older than five years and you are experiencing frequent problems or breakdowns, it may be time to replace the entire pump. In the long run, it may be less expensive than fixing the various parts of the hot tub pump. If you want to experience the most enjoyment from your hot tub, be sure to perform regular maintenance on it. Use a weekly and monthly maintenance schedule and keep the hot tub clean. With, proper maintenance, your hot tub will last for many years. If you are in the Cleveland, OH area and considering a hot tub or swim spa, LeisureTime Warehouse is the place to visit. We carry premium brands that offer quality, features, and performance, so you’ll get your money’s worth for years to come. As a luxury hot tub distributor, we strive to ensure that if you want a hot tub, you’re still able to get one even if you’re on a budget. When you purchase hot tubs from us, you aren’t able to find a better price in the Greater Cleveland area. Contact us or visit us today for a FREE consultation!